The current boom in Scotch whisky start-ups means a busy time for the architects charged with designing new distilleries. So, what makes a new distillery blueprint successful? Tom Bruce-Gardyne reports. Olli Blair grew up watching children’s TV favourite Play School, and recalls: ‘They always had this little film through the arched window of… I don’t know, a milk bottle factory? I found it fascinating.’ Today, as the architect behind the new Raasay distillery on the island near Skye, he’s hoping to inspire a similar child-like fascination among visitors. The need to be rooted and part of a community is a constant refrain among modern distillery architects. The aim is for a well-conceived space for whisky-making that fits its environment in an aesthetically pleasing and – hopefully – memorable way. Raasay’s design features black zinc cladding, gold shingle, a visitor centre and the conversion of a Victorian villa that was on its last legs as a hotel when bought by distillery owner R&B Distillers. On the inside, the stills, dubbed ‘the prima ballerina’ by Blair, take centre stage, although their presence is somewhat eclipsed by the view. ‘If it’s not the best in Scotland, then it’s pretty close,’ he says, describing the Cuillin Hills looming beyond the dappled waters of the Sound of Raasay. Then again, will it be as magical as the view from the stillhouse at Ardnahoe? ‘I designed it so you stand looking through the stills at the Paps of Jura and up to Mull,’ says project director Iain Hepburn of the new Hunter Laing distillery on Islay, located between Caol Ila and Bunnahabhain. Well, they had nothing to fear with Ardnahoe, which was originally planned to have its own kiln and floor maltings, complete with a pagoda (or, if you prefer, cupola) roof. The pagoda has been the defining motif of distillery design since Charles Doig installed the first one at Dailuaine in 1889. It is to Scotch whisky distilleries what Tennent’s illuminated red ‘T’ is to Scottish pubs. Meanwhile, equally traditional from the outside is Torabhaig on Skye’s south coast – so much so that it looks to have been ‘here on the shore, looking over to Knoydart, for 100 years’, wrote Dave Broom in October last year. The distillery has been artfully squeezed into its cramped space – a farm steading and courtyard, where the late Sir Iain Noble dreamed of making whisky. ‘His plans have been considerably changed,’ says Neil Mathieson, CEO of Mossburn Distillers, who insists Torabhaig’s pagoda is there for purely practical reasons – to hide the chimney. There will be a café, shop and tasting room, but ‘our main purpose is to make whisky; we’re not a tourist destination’. The same is true of Dalmunach, built for Pernod Ricard on the site of the old Imperial distillery. ‘It was designed purely for making the product, and is not intended to be open to the public but, at the same time, there was a real pride from the client to create something memorable,’ says Mark Fresson, director at architect Archail Norr. The design was inspired by the setting – a stone’s throw from the River Spey – and whisky’s core ingredients of grain and water, with a pond in front of three linear buildings arranged like a sheaf of barley, with one each for mashing, fermenting and distilling. ‘Being a cluster of buildings, rather than having it all under one roof, allows it to keep to a more human scale,’ says Fresson, whose father once worked at Imperial. Yet, whatever the constraints, Dalmunach succeeds beautifully and was shortlisted for a number of architectural prizes. If ever it becomes known for its own single malt, its owner may have to reconsider not allowing the punters in. Meanwhile, Glasgow’s new Clydeside distillery finally opened its doors in November. Tim Morrison’s project has evolved into something much greater than a need for whisky for his independent bottling firm, AD Rattray. Its aim of celebrating Glasgow’s forgotten whisky heritage was to be as important as distilling 500,000 litres of pure alcohol (lpa) a year. The site chosen was the Pump House. ‘It was right on the tourist route near the new transport museum, Kelvingrove and the Hydro, so there was a good footfall,’ explains John Moore of Hypostyle, the project’s architect. So the site ticked a lot of boxes, but it was not without challenges and unforeseen costs and, as more investors came on board, they all wanted a say. For the city fathers, ‘the key was to find a long-standing use for an iconic building’, says Moore. ‘The design was to be a contemporary modern building to act as a foil to the Victorian Pump House. For a building that has tried and failed at everything from an Indian restaurant to a crèche, and lay derelict for five years, let’s hope it pumps out whisky for many decades to come. 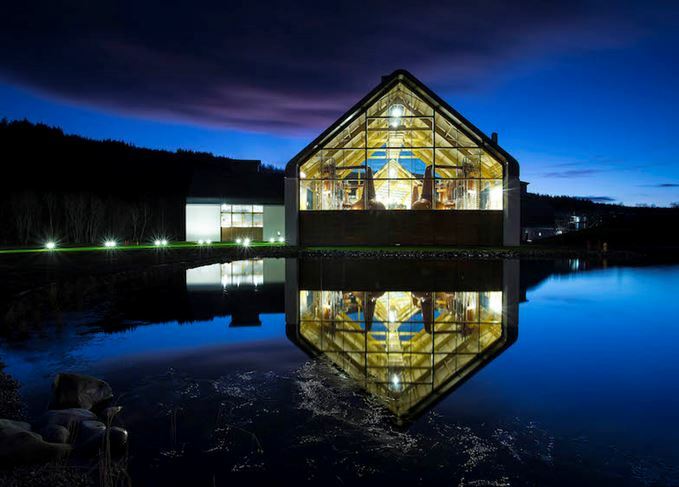 That leaves the grandest design in Scotch right now: the new, semi-subterranean Macallan distillery, five miles from Dalmunach and with a budget four or five times the size. With architect Rogers Stirk Harbour & Partners of Millennium Dome fame, and designer Atelier Brückner behind the visitor centre, expectations are running high. As last-minute adjustments are made, Macallan and its architects are making no further comment, but between them they have certainly raised the bar for distillery design. But will the £100m-plus new super-distillery deliver the promised ‘wow’ factor for visitors? We’ll have to wait until the summer to find out. Discover the 10 new Scotch whisky distilleries due to open this year.